Washington (CNN) -- Four people have died after a shooting in southern Washington, D.C., police said Wednesday. Three people died after the shooting Tuesday night, and a fourth died early Wednesday, Washington Metropolitan Police officer Billy Allen told CNN. Six others remained hospitalized, he said. A total of seven males and three females were injured, he said, but he did not know the sexes of those who died. WJLA: 10 people shot, 4 dead in Southeast D.C. 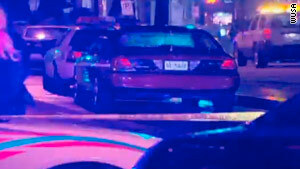 Authorities said multiple shooters opened fire on a crowd Tuesday night. Metro Police Chief Cathy Lanier said the shooting prompted a lengthy police chase that ended in the arrest of three men. Four officers were treated for minor injuries from an accident during the chase. One assault rifle was recovered, a police spokesman said. Another person was shot on nearby Galveston Street, but it wasn't clear whether that shooting was related to the other incident, officials said. Lanier declined to give more details, saying it was too early in the investigation. However, she told reporters that, "We've made a lot of progress to stop gang retaliation and violence, and in the end if this ends up being some kind of gang retaliation -- then shame on all of us."